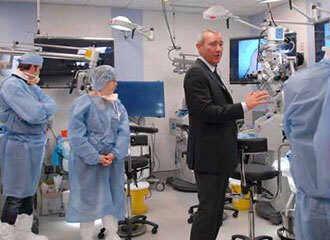 The Surgical Innovations Laboratory for Skull Base Microsurgery at the Weill Cornell Brain and Spine Center (informally known as "the skull base lab") is a state-of-the-art educational facility that integrates exquisite cadaveric dissections, 3D visualization, virtual reality, and computerized simulation for training surgeons and residents in visiospatial skills and advanced surgical procedures needed for treating complex lesions at the skull base. Under the direction of Neurosurgeon-in-Chief Philip Stieg, M.D., Ph.D., and Lab Director Antonio Bernardo, M.D., and with the participation of Dr. Theodore Schwartz, the skull base lab provides unique training opportunities not only for our own residents but for neurosurgeons around the world who can attend lectures and continuing medical education courses in person or via international teleconferencing sessions. The skull base lab features stereoscopy and three-dimensional representation to improve trainees’ conceptual grasp of complex anatomy, and to practice procedures in a safe environment where mistakes do not have dire consequences. Dr. Bernardo developed the unique “interactive virtual dissection” (IVD) technology that allows a trainee to study and practice a transpetrosal approach or other cranial base surgical technique in a 3D simulation. Four times a year, the skull base lab is host to the annual “Surgical Approaches to the Skull Base” workshop, which attracts students from around the globe to study under the highly skilled faculty of the Weill Cornell Brain and Spine Center.